So, the Olympic sailing circus has left Rio. Has it improved opportunities to learn to sail there? While Brazil came away with a Gold medal at the sailing events, and the waters are some of the most beautiful on the world (at least on the surface) there isn’t much for those inspired to learn to sail in Rio. This piece will look at what sailing amenities there are in Brazil and why the country needs to get back to basics to develop what could be a very good tourist industry. The UK seems to have set an example to the world in terms of venues that would remain in use after the Olympics. The athletics stadium, swimming pool, velodrome and National Sailing Academy will see thousands using them for decades to come. With the money for the Olympics the UK National Sailing Academy built a massive new boat launching ramp. This allows large numbers of dinghy sailors to launch and land every day. It now teaches sailing at every level from complete beginners to the best of the best. The Portland Olympic Village was actually built as a new housing estate so with families installed, it will be used for perhaps a hundred years to come! Though it has an elite image, the WPNSA runs a lot of school programmes so kids from all backgrounds can learn to sail. You may be from the local comprehensive as you might be from a posh boarding school – you will still use the same facilities. At the 2016 Olympics, Brazil’s Martine Grael and Kahena Kunze won Gold at the women’s 49er FX. Racing the fastest boat in the women’s fleet, this is no mean feat. You have to be up there among the very best sailors in the world to even compete at that level – this was no chance fluke. Looking at their biographies there is no suggestion that the two sailors came from a poor background. As with many middle class girls and boys the world over, Grael started sailing at the age of 4 on Optimists and developed into one of the best sailors in the world. Many middle class kids do that whether in Rio, Sydney, Baltimore, or Weymouth! Searching Google and Facebook, I could only find one independent sailing school in Rio de Janeiro. This seems to be a family run business centred around a single yacht. Where people who have been with them have given very good reviews, this is not much of a sign that children from the favelas will be giving up football to get into elite yacht racing any time soon! Again, according to Google there are a few sailing clubs. This suggests that the middle and upper classes in the city seem to have captured and kept sailing in the city for themselves. This is quite sad in a way – in order for sailing as a sport to flourish internationally it really needs to be more accessible to all. The world’s sailing media was full of tales of boats hitting dead dogs in Guanbarra Bay and water users becoming very ill. It wasn’t covered so much during the Olympics, but I know for a fact that some of those racing had to run like hell for the toilets as soon as they got ashore. The waters were filthy and gave bad stomach bugs. Not a great incentive to get out on the water is it? However, as part of the planning for the Games a sewerage treatment works was built to clean up the water. Somewhat unsurprisingly it wasn’t finished on time, which is a major reason why many athletes had to pump their guts on the toilet several times a day. 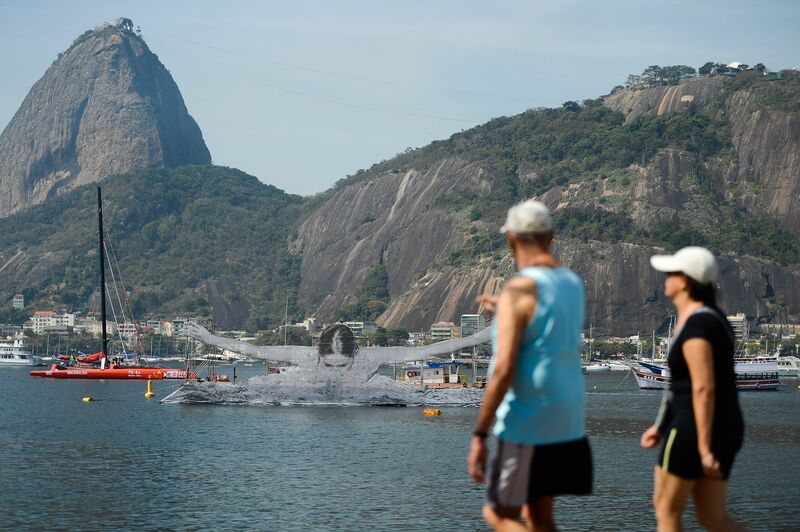 If completed, the sewerage treatment works will be a huge improvement for water sports around Rio. Where currently yacht sailing as opposed to dinghy racing is really the only safe option for those learning to sail in Rio (you spend a lot of time getting wet as a dinghy sailor where you are dry most of the time on yachts. The treatment works may make dinghy sailing more attractive. You have to start somewhere – even if it is as basic as that. I harbour a resentment about sailing. It is far too elitist. Where some countries have a meritocratic sailing system designed to get the best sailors from whatever their background afloat. Brazil needs to wake up and smell the beans if it is to compete on the world stage. If its water was clean it could draw in more dinghy sailing events and encourage more people to learn to sail in Brazil.